Last Friday’s US announcement of the latest version of Q4 2015 GDP along with China’s industrial growth are keeping the USD a favorite currency. ECB, on the other hand, is reaching its limits in terms of its effectiveness. As shown in the chart, EURUSD is hanging around the 61.8% retracement at 1.1163 creating a neutral zone. Although the price is above the SMA of 100, it had been falling for the last recent days. For SMA 20 the price is trying to reach the line at 1.1170. The MACD indicator is showing a price consolidation since it is in a negative territory. The RSI shows that the price is going to stop its bearish movement and let the bears show up. 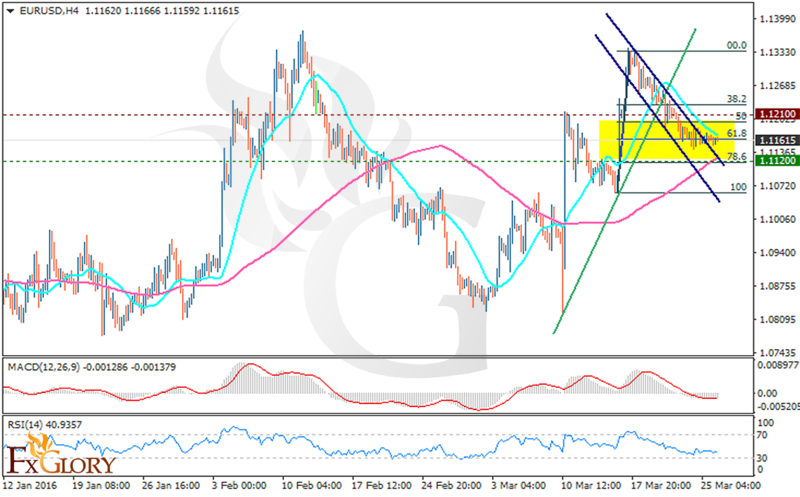 Buyers need to wait for the 1.1260 breakout and then observe a price growth otherwise the price may go down to 1.1050.